"FöRIBEAT" (FerryBeat), a series of radio broadcasts was made in early 2006 introducing the pioneers of, and invasion of rock and merseybeat in Finland. As a final to the broadcasts, a large happening was organized in "Kåren", Turku, with seven top scoring pop and rock groups of South Western Finland of the sixties. Madmen was one of the groups. Only two of the former musicians of Madmen were unable to take part in the event. Madmen performed as a quintet. The absent bass player Juki Laurikko and singer Henry Jansen were surrogated skillfully by Jouko Linko. 2010 After four years of playing, everything feels even better. At last we also have the pleasure of old friend and fellow musician Markku "Silli" Silander joining the band. His keyboards will be heard next time in the "MUSICAL TIME TRAVEL TO THE 60's". 2012 - six years of a new era of Madmen! There is an old saying in Ostrobothnia "Good things remain and age well". Silli has taken up a position in the group in a tasty manner. The wishes and visions, sounds and interpretations are fitted together in a way that delights and impresses at every rehearsal. Come and listen for yourself at "Sixties alive!". Link below. 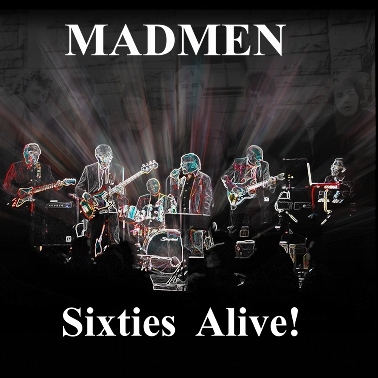 We have published an official live Sixties Alive!-cd. The cd contains 23 songs recorded at the concert. This cd is not commericially abailable. On the stage, once more! We have been invited to perform in the "Open Forum" event. YLE Turku radio Wed 13.10. Past Brankku. Hoping for a report soon. This was tuned to be a promotion for the Föribeat musical. The initial idea of us taking part in the musical was dropped, so we didn't fit as a promo group either. Started rehearsals in the beginning of September. Working on new songs once a week. Considering hardware investments. Föribeat gig left a sweet taste. Good enough to make a decision of continuing.